Back in October, I bought some lumber to make a bed. But I didn't get around to starting the project until now. Lots of sanding, and I got to use my router which I don't get to use very often. 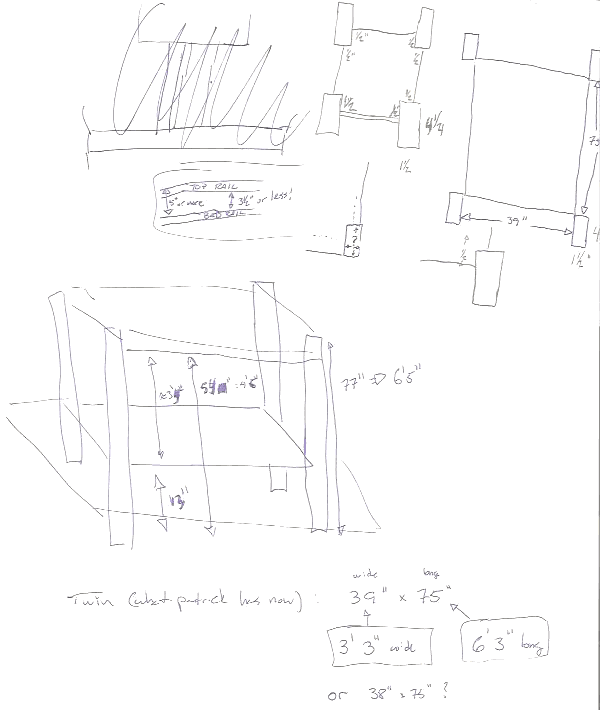 The plan is simple: the 2 very large pieces were split down the middle to make the 4 posts measuring 4¼" x 1½" x 8'. Then build two boxes measuring 39"x75" for the beds. The first box will be 13" off the ground, while the top bunk will be about 48" off the ground. A bunch of rails permanently attached to the foot will be the ladder. Staining took a few evenings, mostly because I didn't have much room to lay the pieces out to dry. Everything is now put together; this weekend I'll go out and buy Denis a matress and sheets.